If you're too busy to do laundry or cook dinner, you probably don't have loads of time to invest either. Many people in your shoes are putting their investments on "auto pilot" in target date funds. You sign up, put your money in the fund and basically forget about it until you retire. It's called "target date" because you select one fund to put your money into that best matches the approximate year you want to retire. So if you're 25 today, you probably want to go into 2055 fund (which works out to retiring around 65). It's essentially a one-stop shop for investing because target date funds gradually adjust the amount of stocks and bonds in your portfolio. They become more conservative as you near retirement. So when you're 25, the target date fund typically has you more heavily invested in stocks. By the time you retire, your portfolio is heavy on the bonds. New, inexperienced investors are more likely to enter into target-date funds than anyone else, according to a study by University of Missouri professor Michael Guillemette. A popular choice: "[Target-date funds are] simply a way for an investor to let someone else drive the car," says Brad McMillan, chief investment officer at Commonwealth Financial Network. Average investors "are probably going to come out better with a target-date fund...than they're going to do by themselves." In theory, they are simple. But they aren't bullet proof. Like any investment, you want to do a little homework, especially on fees. The managers of target date funds can use an array of investing options to make up the portfolio. Some of those investments cost more than others. It's not entirely "one size fits all." 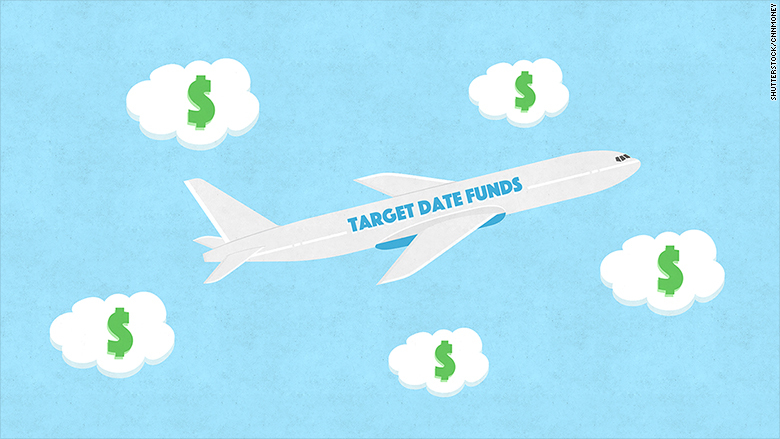 But increasingly, target date funds are finding appeal with young investors. Born in 1994, target date funds have ballooned in recent years. People had over $700 billion invested in target date funds at the end of last year, according to Morningstar. That's about double the amount from 2011. A key law change in 2006 has allowed employers to automatically enroll employees who do not want to actively manage their 401(k) money into target date funds. That has also spurred the big surge in target date investing. 1. How much time do you want to spend on your funds? Consider how much time you want, or have, to manage your investments. 2. Can you invest better than a target date fund? Can you do better than the "auto pilot" option? Take a look at performance over many years of the target date fund versus some of your other options. 3. What are the fees? If they're high, it might take away some advantages. 4. Did your employer automatically enroll you in a target date fund for your 401(k)? Call up your provider and ask if you are uncertain if you're already enrolled in a target date fund. Here's the skinny on target date funds recently. Performance: Target date funds are beating the average Joe. Only 41% of retail investors -- that's you, your mom, your dad, etc. -- beat the average gains of a target date fund last year, according to Openfolio, an investing app that allows users to share their portfolio and compare with others. Generally speaking, target date funds -- with their mix of stocks and bonds -- have performed better than bond funds but a little less than equity funds in recent years. The average S&P 500 total return fund, which is all stocks, gained about 12.7% in the last four quarters. The typical target date fund that expires in 2040 -- think where you'll be in 25 years! -- gained 6.6%. Barclays Total Return bond fund, a yardstick for how many bond funds perform, rose 5.7%. The key difference is that a target date fund offers the diversity that a bond and stock fund do not. You may have made more in all-stock fund in the past 12 months, but you're also more vulnerable to volatility. Fees: They vary. There are three big players in target date funds: Fidelity, T. Rowe Price and Vanguard. On a fund that "expires" in 2045, Fidelity charges 0.75% ($7.50 for $1,000) and Vanguard charges 0.18% ($1.80 per $1,000). Fidelity and T. Rowe Price are more expensive because they invest in actively managed funds -- stock and bond funds run by people. The idea is that these experts should beat the market over time. But that's a big debate in the investing world. Vanguard, on the other hand, invest solely in passively managed funds, which just mimic indexes like the S&P 500. It's very cheap to do that, although you're not going to "beat the market" when you essentially own the market. When happens when you hit the target date: When a target date fund reaches its end year -- say 2055 -- it doesn't simply end overnight. It lives on, just becoming more and more conservative until it reaches a landing point where the allocation doesn't change. If the fund is never cashed out, managers roll it into a retirement fund, says Jeff Holt an analyst at Morningstar who covers target date funds. The biggest consideration is to ask yourself how much you want to learn about investing and how much time you want to spend on it. With a target date fund, you don't need to learn much and you will have more time to make dinner, play with the kids or mow the lawn. "It's similar to going to the doctor," says Holt. "Do I want to hand off the responsibility to the surgeon or do I want to just learn how to do it myself?"